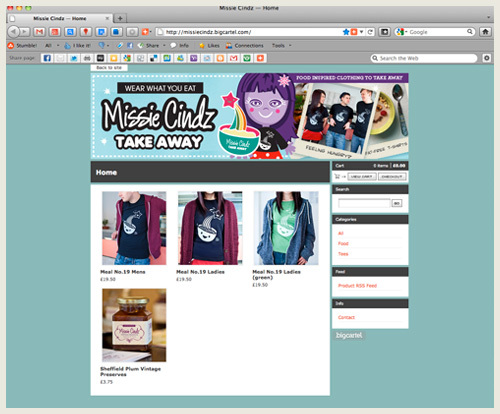 Missie Cindz Takeaway open on Big Cartel, go and shop TODAY! Love food? Love cute designs? and Love fashion? – then ‘Missie Cindz Take Away’ will be the only take outs you’ll be scoffing from and wearing this summer! Take Aways have just got a lot more interesting and colourful – well, ours has! It’s my new spin on the ‘boring/greasy’ take away food. my ‘Missie Cindz’ is an independent graphic and illustration label, where at our ‘Take Away’, we offer customers hunger-filling T-shirts, accessories for men and women and tasty seasonal food products. My first design, Meal No. 19, is available now in sizes S to XL! and all shirts are high quality and hand screen-printed locally in my home city, Sheffield, on heavy cotton. Our Missie Cindz’s take outs are the perfect antidote to a fun-packed and adventurous summer – made for wearing ASAP! Yum.